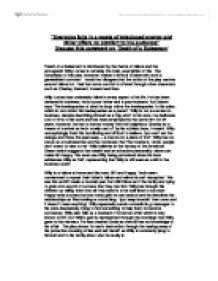 &quot;Everyone fails in a waste of misplaced energy and Miller offers no comfort to his audience&quot; - Discuss this comment on 'Death of a Salesman'. 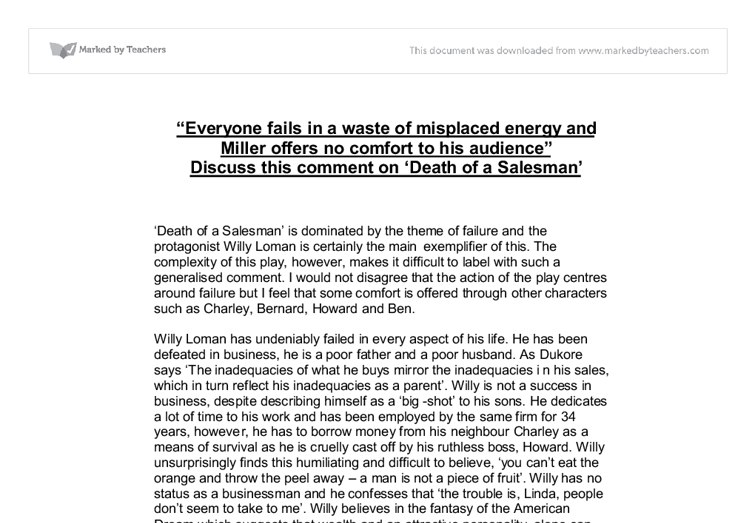 "Everyone fails in a waste of misplaced energy and Miller offers no comfort to his audience" Discuss this comment on 'Death of a Salesman' 'Death of a Salesman' is dominated by the theme of failure and the protagonist Willy Loman is certainly the main exemplifier of this. The complexity of this play, however, makes it difficult to label with such a generalised comment. I would not disagree that the action of the play centres around failure but I feel that some comfort is offered through other characters such as Charley, Bernard, Howard and Ben. Willy Loman has undeniably failed in every aspect of his life. He has been defeated in business, he is a poor father and a poor husband. As Dukore says 'The inadequacies of what he buys mirror the inadequacies in his sales, which in turn reflect his inadequacies as a parent'. Willy is not a success in business, despite describing himself as a 'big-shot' to his sons. He dedicates a lot of time to his work and has been employed by the same firm for 34 years, however, he has to borrow money from his neighbour Charley as a means of survival as he is cruelly cast off by his ruthless boss, Howard. ...read more. 'Despite its realistic trappings, 'Death of a Salesman' is universal, thus a more vivid dramatisation of a modern everyman' - Willy is also representing the destruction of everyone who has bought in to the American dream, and in this way the play could also be called a political play. The mixture of traditional tragedy and Miller's own unique brand of drama allows the audience to recognise the protagonists' flaws in themselves. Willy's energy is certainly wasted as he spends the majority of his time at work, without anything to show for it. This could contribute to his failure as a husband and a father as dedicating more time to these things may help to repair broken relationships. Willy is so committed to the American Dream that everything else in his life seems to be breaking around him including household items like the fridge and the car. This symbolises Willy's race against age and limiting factors to be a success, and he fails to do this. We learn in the play that Willy is good at practical work and this work is admired by Charley, 'That's a piece of work. To put up a ceiling is a mystery to me. How do you do it?' ...read more. I would disagree that Miller offers no comfort to his audience. By the end of the play, Biff admits to his father that 'I'm a dozen, and so are you' and instructs his father to 'take that phony dream and burn it before something happens'. Biff's turns his back on the American Dream and this is certainly comfort to the audience because he has found himself and knows who he is unlike his brother, and his father. There is a lot of failure in this tragedy. The focus of the play is Willy Loman who does fail and it would also be true to say that Willy does misplace his energy and there is little comfort due to the emotion of Willy's suicide. Miller said that 'Most human enterprises disappoint' and this view is certainly shown throughout the play and through Willy's life. Bernard and Howard, however, are very successful due to hard work and if nothing else this is comfort to the audience as they represent a type of success which isn't based around being 'well liked'. Biff's enlightenment at the end of the play is also comforting as there is now some hope of success beyond the American Dream and hope that Biff's energy will be used in a more constructive way. ...read more. Bernard was the boy who Willy told his sons 'Will not succeed in business' because he was, 'Not well-liked'. And what goes through a man's mind, driving seven hundred miles home without having earned a cent? Willy is getting old, and to him, life has already ended. All he has is his hopeful past to and his memories to hold dear. His family was something he equally misunderstood. His wife and 2 children did not let him know that they knew the truth about him. They wouldn't tell him that his beliefs were wrong even though they knew that he was trying to kill himself. They did not always support him. Biff has failed, in other words, mainly to "spite" Willy. Although outwardly resenting such alleged vindictiveness. Willy still wants to get back the old comradeship, even if he has to buy it dearly. "Why can&#39;t I give him something," he asks the spectral Ben, "and not have him hate me?" They all appear to be fighting back against external forces which are dragging them away from the American Dream. However, when Willy is fired in the next scene with Howard, Miller has used the helplessness expressed by Willy in this scene in order to indicate that his title as a victim is still justified. Willy believes sincerely that wealth is happiness and the number of brand name goods you have shows your wealth. Willy then looks around and notices he has little brand name goods, thus little money and thus he is a failure.